–> A variable is used to store the value. You can use the variable throughout your Flow. Input/Output Type determines whether the variable can be accessed outside the flow. –> Record Lookup element allow you to finds the first Salesforce record that meets specified criteria. Then assigns the record’s field values to individual flow variables or sObject variables. –> Name refer the group name, corresponds to Label on the user interface. –> VarT_PublicGroupID is a Text Variable of Input/Output Type Input and Output. –> Make sure to select the checkbox Assign null to the variable(s) if no records are found, as shown in the preceding screenshot to sets the variables to null if no records meet the filter criteria. By default, the variable’s values are left unchanged. 6. Save the Flow (Type: – Autolaunched Flow) with name Add Partner User to Public Group – Flow and close the canvas. Don’t forget to Activate the Flow. 5. The next step is to add a Scheduled action to Process. Under Scheduled Actions, click Set Schedule. Set the schedule for 0 Hours after the account CreatedDate. 6. Now that you have a schedule added to your process, next step is to add the Flows action to it. For this select action type Flow, Use Field Picker to choose the field [User].Account.AccountNumber and [User].Id, as shown in the following screenshot. –> The reason behind to use time-based action is to avoid MIXED DML error. DML operations on certain sObjects, sometimes referred to as setup objects, can’t be mixed with DML on other sObjects in the same transaction. It means we cannot perform DML Operation on both Setup and Non-setup object in a same context of execution. 1) Navigate to the Account tab, then open account Grand Hotels & Resorts Ltd. 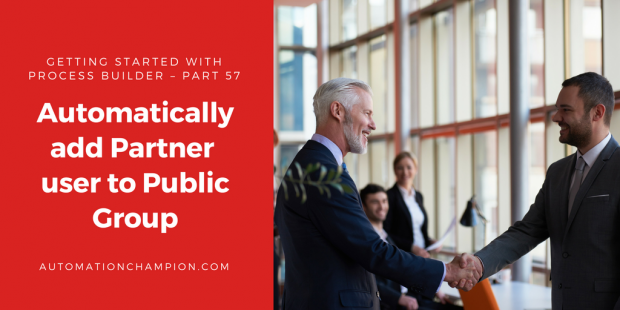 I have already enabled it as a Partner account in my last article Getting Started with Process Builder – Part 56 (Auto Create a Public Group for new Account). It will redirect you to new user setup screen, from where you can create a new user. Join us (co-hosts Rakesh Gupta, Jennifer Lee, and David Litton) on Oct 14 at 3-4pm ET for the second webinar of Salesforce Automation Hour! Hi, thanks for sharing this, I always enjoy following this blog, many good ideas already came from what you are presenting here ! I have one question: will the above work when you use DataLoader to insert a few hundred records at a time ? Reason I am asking is, I just had a similar setup with Process Builder and Flow, where process builder kicks off a flow that will add newly activated user’s to some Chatter groups. The flow would check if they maybe had been a member already before and then add them if not. An error occurred at element Lookup_all_Chatter_Group_ID (FlowRecordLookup). I don’t have more details right now and I was not able to do de-bugging, I was just wondering if your setup works with bulk records uploaded via DL. The reason why it is failing is because of no filter condition added in the Fast Lookup screen “Lookup all Chatter Group ID”. Adding any filter value will solve this issue. This seems to be an issue and there is already an investigation raised with salesforce. This issue will be fixed in the next release (release 206).